I’ve been doing lots of testing of my time-lapse gear all week and Sydney Harbour Bridge became a subject of the first real field test. I should say that it was an interesting experience to stand there with two large tripods, two cameras and with stack of filters attached to both cameras. The whole set up was looking very serious. Unfortunately, I’ve identified a few issues with mechanical part of my DIY motorised panning tripod head, so I have nothing worth demonstrating at the moment, hopefully it will be fixed this week. On the positive side, it was a long process, so I had plenty of time to take pictures as well. 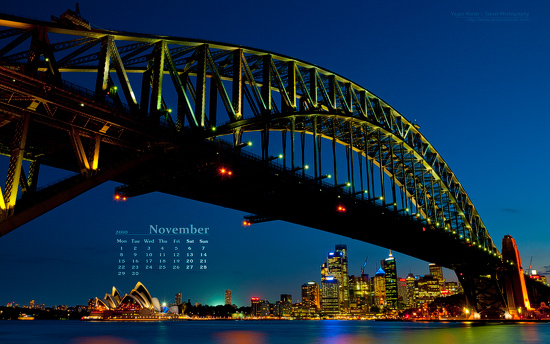 As before, this and older wallpapers with November calendar are available for download here: Free Desktop Wallpaper Calendars.